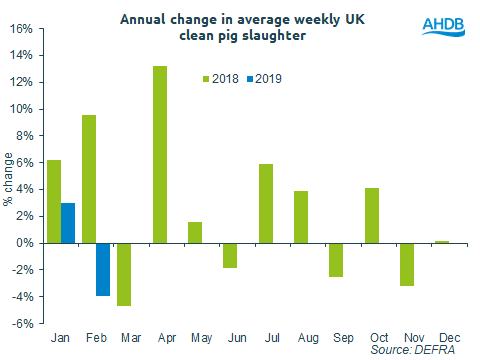 New data from Defra has revealed that UK clean pig slaughter in February was 834,200 head, 4% lower than the same month in 2018. This was driven by a 6% drop in slaughter in England and Wales, as throughput in Scotland and Northern Ireland increased by 4% and 7% respectively. AHDB analyst Bethan Wilkins said the overall decline probably reflects poorer herd performance last year, due to disease challenges and hot summer weather from around May negatively affecting sow fertility rates. She said: “Adult pig slaughter totalled 19,000 head, 12% (4,000 head) lower than last year. This follows a particularly high slaughter rate in January, and across the two months throughput was still 1% higher. Ms Wilkins added that a 1% increase in clean pig carcase weights meant that altogether, UK pig meat production was 73,700 tonnes in the month, down 3% compared to February last year.